Rapid data growth from a wide range of new data sources is significantly outpacing organizations’ abilities to manage data with existing systems. Organizations now look to capture all data, keep it longer, and prepare to use the data in new ways as business conditions evolve. As a result, legacy data architectures and IT budgets are straining under the pressure. 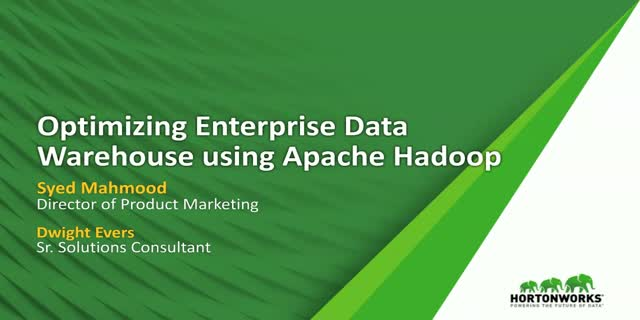 Community-driven open source technologies with Apache Hadoop at its center offers a viable approach to making data architectures capable of realizing new and improved business outcomes while driving significant cost out of the IT budget. Hear Syed Mahmood, Director of Product Marketing, and Dwight Evers, Solution Engineer at Hortonworks, discuss how the IT landscape is changing and offer insights into how data-driven organizations are successfully navigating this shift to higher revenues and lower IT expenditure.